While we were down in Vegas, Ava decided to take her first swim. 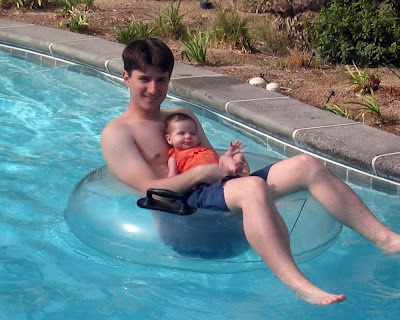 She had to sit in her daddy's lap since the water was a little too cold for her, but she seemed to enjoy herself nonetheless. Ava was joined in the lazy river by Owen and Brady (the boyfriends of her Aunt Betsy and Aunt Lauren) and her Uncle Jordan and Uncle Ethan. As a side note, Brady recently got his mission call to Munich, Germany. Uncle Ryan and Aunt Kelly did not have their bathing suits so they were kind enough to take these pictures. We're sorry we didn't get any close-ups of Ava in her new suit, but we'll be sure to take some the next time she goes swimming. Despite BYU's heartbreaking loss to UNLV, we had a really fun time in Las Vegas. Krista got to see Celine Dion at Caesar's Palace, we ate lots of great food, and we enjoyed the sunny weather and time with our family. Looks like you all had a good time!! Ava looks cute even though it's not a close up!!! Wish we had warm weather like that up here more often...it'll come soon enough I'm sure!! !